A mix of postmodern lounge and his former band’s best moments, this odd and rewarding album adds to Eitzel’s reputation as an adventurous solo artist. Mark Eitzel has always been a contrarian. As leader of American Music Club, he declared, on that band's 1993 major-label debut, Mercury, that "I lay all my songs at Johnny Mathis's feet." Released at the height of the grunge/alternative commercial moment, many listeners didn't get the reference; fewer got the joke. Eitzel's solo output has been equally challenging, undermining preconceptions and frustrating expectations while, nonetheless, establishing him as an artist always worth watching. His challenges offer profound rewards. At heart, Eitzel has always been more a crooner than a shouter, even in his angriest of Angry Young Man days. Had he been born 30 years earlier, he could have been a satellite of the Rat Pack, their bohemian friend who could match Frank and the boys drink for drink while challenging their old-world sensibilities with his Beat-inspired songwriting. That element of Eitzel's artistic personality dominates his latest record, Hey Mr. Ferryman. Eitzel's voice has only grown more sublime as the years have passed. Recorded at London's 355 Studios and produced by Bernard Butler (ex-Suede), who plays all electric guitar, bass, and keyboard on the album, Hey Mr. Ferryman might be the most American Music Club-like among his solo records. Butler's arranging retains that band's ability to soar sonically while also echoing and amplifying Eitzel's emotionality. In Butler, Eitzel has found a kindred musical spirit. Wry reflection upon his life in the music industry colors one of the album's dominant threads. Opening with the cryptic yet welcoming "The Last Ten Years", Eitzel seems to offer a tongue in cheek critique of his album-making process, singing "I spent the last ten years / trying to waste half an hour." And if the ferryman referenced here doesn't cross the River Styx, he stands in as a pretty accurate representation of the music industry itself, with Eitzel offering all his money in the hopes of a rum and coke in return. "The Road" offers homage to the battered, weary musicians who trudge through the seemingly endless process of touring. When Eitzel sings "We'll lose the war to win a fight," he calls to mind Leonard Cohen's having dubbed his backing band "The Army" in the early 1970s. Throughout the analogy, there's a sense of expending great effort for minimal gain. Or worse, earning more pain for the suffering, as when in "In My Role as a Professional Singer and Ham" Eitzel declares, "Instead of a cane, I got this broken soul." 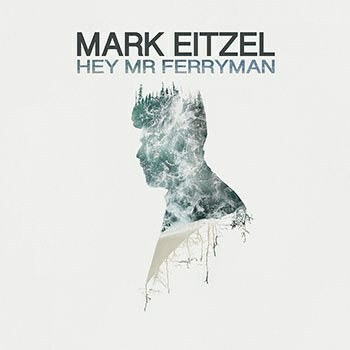 The crisp and ironic light jazz approach that Eitzel has often exhibited in his solo work also flavors the record's character, so much so that at times Hey Mr. Ferryman could be described as a postmodern lounge album. That applies to "In My Role..." and especially of "An Angel's Wings Brushed the Penny Slots" which builds its anchor melody around a programmed, synthetic organ beat of the kind one could hear in any mall organ store in the 1980s. Meanwhile, the lush orchestration of "An Answer" offers Eitzel an opportunity both to engage in his popular art of self-deprecation ("Dancing's the only thing I do right") while also sharpening his ability to depict a sense of romantic longing. Being an Eitzel work, Hey Mr. Ferryman is not without its darker moments, which provide some of the album's high points. "Nothing and Everything" may be the most harrowing depiction of an abusive relationship, not just through Eitzel's spot-on observational reporting but also through his dispassionate recitation. He sees this abusive relationship with clear-eyed dispassion, offering a Devil's Dictionary definition of it as a prison consisting of a warden, prisoner, and two dutiful guards: in all, two people. Similarly "La Llorna" offers the story of a woman who becomes a victim of her self-sacrificing nature. In all, Hey Mr. Ferryman is a welcome return from one of America's most consistently challenging and rewarding songwriters. It's an album that creeps up on you slowly, its hooks subtle but, once set, inescapable.